Eldepryl benefits | Does Eldepryl Increase Brain Power? It was in the 1960s that scientist Joseph Knoll discovered Selegiline, which is more popularly known by its brand name Eldepryl. He had been investigating the physiological differences between high achievers and those who aren't and asked for possible compounds that had certain properties in them in order to continue with his work. He chose a chemical called deprenyl from the list and found out that it had two different forms, one of which was selegiline. 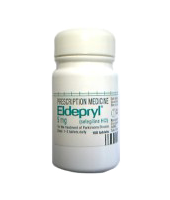 Eldepryl is used as a treatment for Parkinson's disease in its early stage as well as for senile dementia and depression. The use of the medication is found to slow down the progression of Parkinson's disease. Although it had originally been developed as an anti-depressant, regulatory agencies approved the medication because of its anti-neurodegenerative properties. It is still unsure what long-term effects Eldepryl could bring to patients. However, those suffering from Alzheimer's disease are found to reap a lot of benefits as the medication could help lower the dopamine levels in the brain. It is still under investigation as to whether or not the medication is effective in treating ADHD and in helping those who would want to quit smoking and marijuana. The less serious side effects of Eldepryl are nausea, dizziness and sickness. Users may also experience indigestion as well as a feeling of anxiousness and agitation. Patients taking the medication should get up from a reclined position carefully as rising quickly could result to dizziness and faintness. Other side effects may include difficulty in sleeping, rashes and muscle pain. Eldepryl can bring about serious side effects, which is why it is recommended as a last resort in treating depression. It could result in severe headache and sweating, chest pains, breathing difficulty, hallucinations, uncontrollable shaking and irregular heartbeat. It is not advisable to suddenly stop intake of Eldepryl. How does Eldepryl help brain function? The monoamine oxidase (MAO) is an enzyme found all over the body, including certain areas of the brain. As a person's age starts to increase, these enzymes increase its activity resulting to the reduction in the neurotransmitter levels. It is with the help of Eldepryl that the MAO, specifically the MAO-B or those enzymes whose primary activity are found in the brain, are inhibited and thus neurotransmitter levels are modified in the process. Want more information on which supplements ranked better than Eldepryl? Then take a look at our brain supplement reviews!